The following materials are taken from stock exchange filings subimitted by Sammi Steel, the Korean iron and steel company, from 1996 to 1990. Please look through the comany's sales and profitability trends, its balance sheet, its leverage, its fixed charge coverage and other key indicators of financial health. Do you see anything of concern? As a shareholder of this company, what financial restructuring, if any, would you recommend? stainless steel and pig iron accounted for 67% of 1994 unconsolidated revenues; lumber, 23% and other, 10%. Unconsolidated revenues accounted for 98% of 1994 consolidated revenues. The company has one consolidated affiliate company in South Korea. 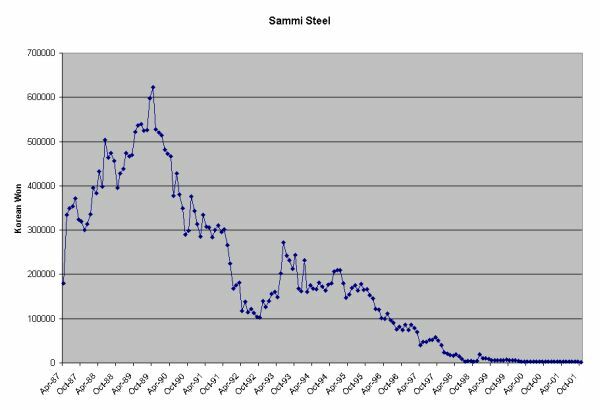 Click here for a graph of Sammi Steel share price performance since its IPO in 1987.